Taken from The British Fashion Council, and inspired by last weekend’s London Collections: Men where Hardy Amies’ Creative Director Mehmet Ali showed the luxury brand’s A/W 2015 collection. When Sir Hardy Amies launched ‘Man’, his debut menswear catwalk show 51 years ago at The Savoy hotel onlookers were agog with Society doyenne Lady Diana Cooper declaring, “Daahling… but it will never take off”. The subsequent headlines proved her quite wrong with glowing reviews for a unique event from the man who dressed HM The Queen. 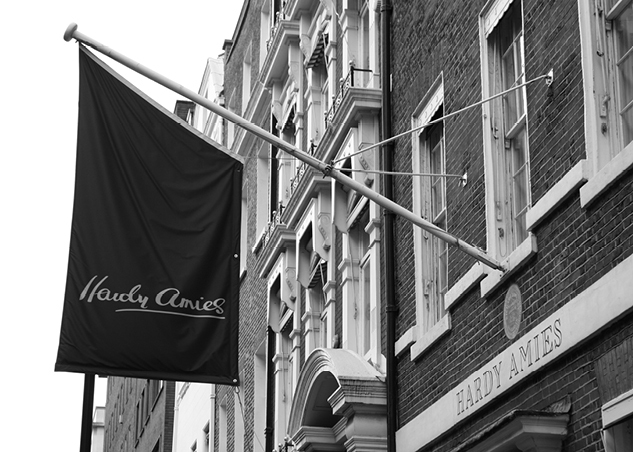 Over half a Century later, the House of Hardy Amies is now under the distinct eye of Creative Director Claire Malcolm. Dapper, dashing and aquiline, Sir Hardy Amies and his diktats were all too often terrifying. A lover of men and menswear he detested cufflinks, liked leathers and thought it naff to wear black tie in the evening – always insisting on midnight blue. He turned his nose up at turn- ups, was bemused by the 1960s beatnik look and on the subject of men’s underwear demanded it be ‘kept brief’. 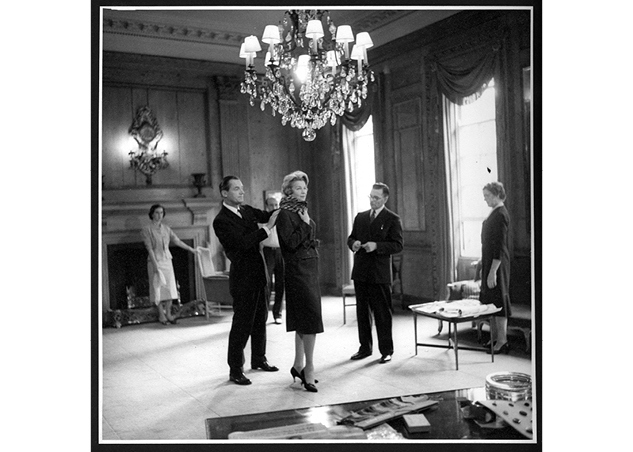 As the first designer to put menswear on the catwalk in 1961, Hardy Amies decided the event had to be ‘special’, moreover memorable. The show proved to be a first on many levels. It was the first of its kind to have recorded music playing and the first time a designer accompanied his models on stage. The designer Kenneth Partridge (who was the mastermind behind every society ball and pop-star home of the time), Brian Epstein and John Lennon, produced the show. Partridge recalled Hardy’s excitement. “Hardy was like a child in a candy shop. He was determined the show would be a success and intent on making as big an impact as possible joined the models on the catwalk at the close of the show. Something that had never been seen before”. He continued, “He picked the music and then keeping it a secret even from me, arranged for the creation of a gargantuan paper maché gloved hand adorned with bracelets and rings to wave regally behind the models at the close of the show. Hardy Amies told reporters afterwards that the hand was the Queen giving menswear her seal of approval”. The Queen was said to have been amused when hearing of the spectacle. 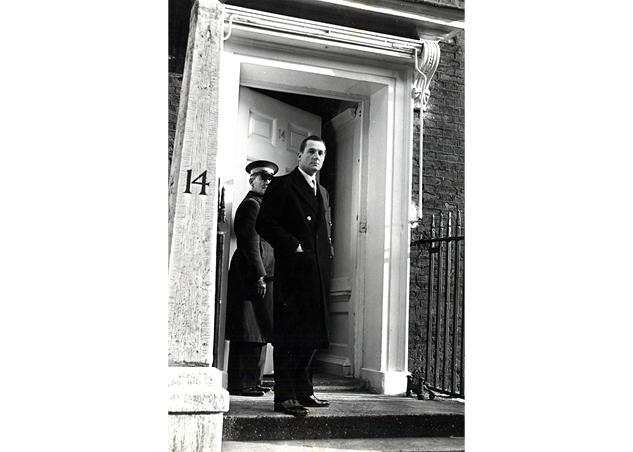 A former Hardy Amies PR man described Sir Hardy Amies as, “Imperious, arrogant and pompous, but saved by great wit and a wonderful sense of humour”. Sir Hardy Amies would quite agree adding ‘snob’ to the list. Outside the constraints of Buckingham Palace, Amies found other avenues to channel his wit, frivolity and sarcasm, the latter usually on the barman at his London club, if he dared to forget to have martini with a twist of orange peel (his own recipe) waiting on his table on arrival. 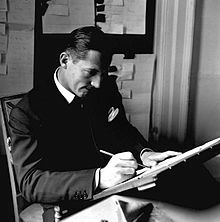 The only man in the British army to have his uniform tailored on Savile Row, Amies never forgot his fashion background (beginning as Design Director at the House of Lachasse in 1934) even when in the midst of armed warfare on the front line. He actually engaged famed war photographer Lee Miller to produce a series of poised pictures for Vogue before he left to serve in Belgium. Amies dressed HM The Queen and the wider House of Windsor and before the Windsor’s, Hollywood Royalty, becoming great friends with Edward G. Robinson, Douglas Fairbanks Jnr., and great beauties Ava Gardner and Hedy Lamarr. By the 1960s his involvement in film and film stars transcending to costume designer on Stanley Kubrick’s 2001: A Space Odyssey, Two for the Road with Albert Finney and Audrey Hepburn and re-inventing the bowler hat worn with great modern splendour by Patrick McNee on The Avengers. David Hockney favoured wide pin-stripe coats whereas Peter Sellers liked skinny fitting suits. Despite the attraction of high profile names, not every star was welcomed by Sir Hardy Amies with open arms. Society legend Zsa Zsa Gabor recalled seeing Hardy give Frank Sinatra a dressing down in LA in the eighties. “Hardy looked Sinatra up and down and told him that for a man of his stature, to wear a double-breasted suit was wrong! Wrong! Wrong!” Another witnessed Hardy insisting a prospective client take up a gym membership before expecting to wear a Hardy Amies suit with flair! Sir Hardy’s lore on the subject of dress was always direct and droll famously demanding that, “A woman’s day clothes must look equally good at Salisbury Station as the Ritz bar” and for men that, “A man should look as if he had bought his clothes with intelligence, put them on with care, and then forgotten all about them”.